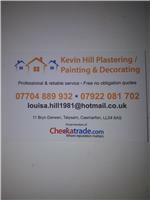 Kevin Hill Plastering - Painter/Decorator, Plasterer based in Llangristiolus, Gwynedd. I am a sole trader that provides a clean, reliable service with 11 years plastering experience and 27 years painting experience, all my work is carried out is to a very high standard, customer satisfaction is very important to me. I also provide free quotations.